Q: What are the sleeping arrangements in the house? 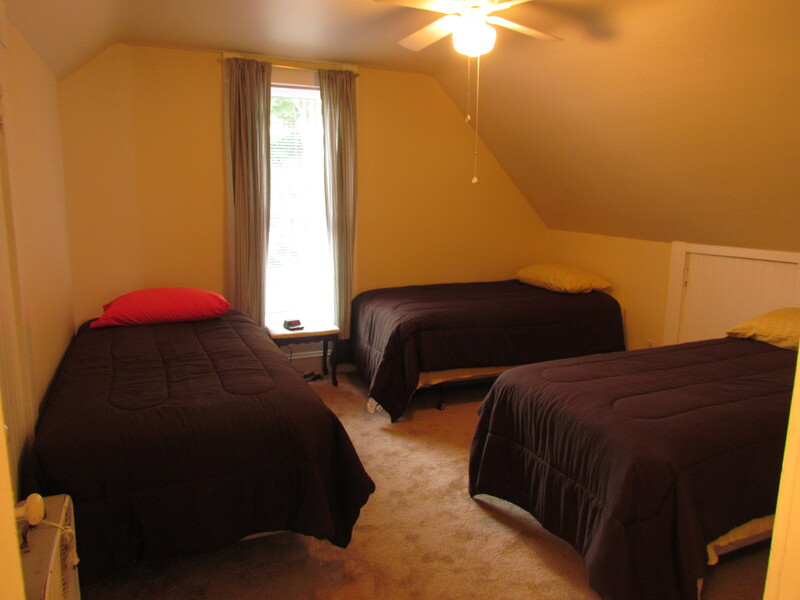 A: The house is set up with 13 twin beds in the upper bedrooms. The Daylily Room has six beds. The Trillium Room has three beds. The Primrose Room has four beds. 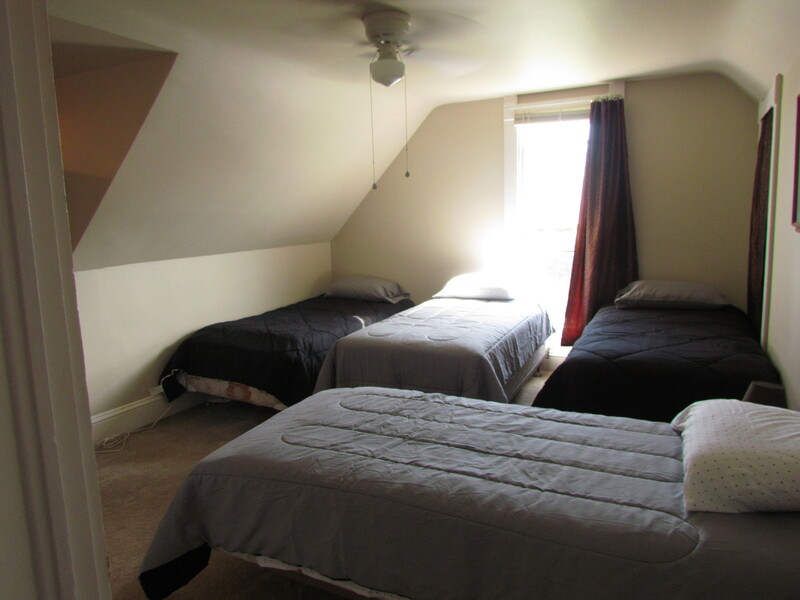 There is also the possibility of sleeping on the two futons in the den on the main floor. There is space for air mattresses if you would want to bring those as well. We can make up a king size bed for your stay if necessary. All of the bedding is provided. Q: What are check in/out times? A: Check in on Friday anytime after 10am. Check out on Sunday by 5pm. We can be flexible with these times if the schedule permits. If you are interested in additional nights, we will work to accommodate you and your schedule. Q: Can I rent The Magnolia of Montgomery County for more than a weekend? A: ABSOLUTELY!!! It was designed with crafting retreats in mind but can handle so much more. You may bring your small group to relax, brainstorm, strategize, celebrate, hang out and visit. 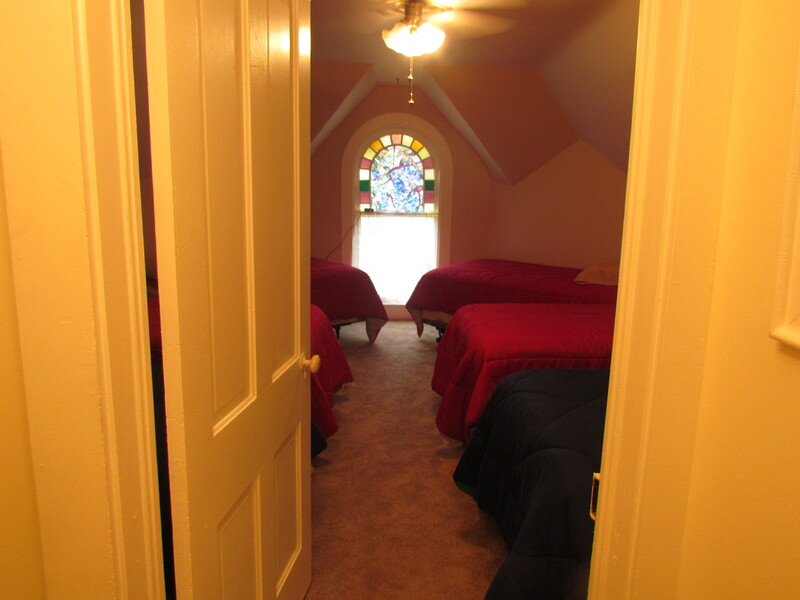 We can set the rooms up to fit your needs. Family reunion, business meeting, bible studies, birthday parties, showers, weddings, reunions, scrapbooking, quilting, stamping, beading, card making, you name it - we can figure it out. Q: How much space is available for crafters? A: We can fit 13 tables comfortably in the space, allowing each person to have a 3' x 6' table with a rolling task chair, drink holder, trash bin, desk light and extra plugs. Q: What tools are available at The Magnolia for crafting? A: While we do have scrapbooking tools on-site, unless we are there (discuss options with us) we will not make these available for general use. We will however, set up a tool table for you that your guests can use for the weekend. We also have some inventory on-site that we can make available if needed. Q: Can I access internet while at The Magnolia? A: Wireless internet is available to all guests during your stay. A: 1] Bring any personal items you will need - clothes, toiletries and crafting supplies. 2] You will have access to the kitchen so bring whatever food you need. We do have some of the basics (coffee, hot chocolate, tea, sugar (stevia), creamer, salt, pepper, some spices, cooking spray, coffee filters, paper plates and cups, napkins, plasticware). The kitchen does have real dishes and utensils that you are welcome to use. Pots and pans, bowls, serving trays/dispensers are also available. Two crockpots, coffeemaker, a blender, a toaster, electric can opener, microwave, 2 element hot plate, and dishwasher are also in the kitchen. The refrigerator is open for your perishables. A mini fridge has been added to use for drinks. There are some storage containers and bags to use while you are at the house. 3] Linens are available for bed and bath. Each guest will have a towel, hand towel, and washcloth. The beds have one pillow, sheets and a comforter. There are several cotton throws to use on the beds or while hanging out in the den. Q: What about smoking and pets? A: Smoking is not allowed inside the house or on the patios. You may smoke on the public sidewalks as long as you dispose of your butts safely. No pets are allowed on the property. A: The Magnolia sits on a corner lot. There is space on Franklin for about five cars, and then on Elm about six to seven cars. There is also a grass alley outside the back fence where you can park, and just east of the property there is a public parking lot for the town park. And just down the block there is parking behind the Main St. businesses in a paved lot. Q: Is there a landline phone at the retreat? A: There is a phone for local calls only. Cell phone service is spotty, but does exist. If you have AT&T, let us know and we can connect you to the MicroCell. Q: So what about meals and food for our stay? A: You bring what you want, visit local restaurants (menus and locations provided in house), contact a caterer to bring food in or work with us on a menu which will be provided at an additional cost. Q: Is there a chance we can have massages scheduled during our stay? A: We do have several massage therapists who will bring their services to you. Since they are independent contractors and have their own businesses, we do need to know as soon as possible if you are going to want one of them to come visit. They will provide their own paperwork and fees, separate from your stay at The Magnolia. Q: Is there a minimum number of guests that we need to have to rent the retreat? A: There is not. We have set rates based on per person/per night. Now if you do have a full house, we may be able to offer some specials throughout the year for groups. If you are bringing a smaller group and are open to having others join you, we can always put out an invitation to some of our other clients to let them know. Q: Do we have to clean before we leave? A: Cleaning will be done after your departure. We do ask that you DO NOT strip the beds of sheets and pillowcases. Please gather all used towels from bath and kitchen and put on the floor near the laundry. Load and run the dishwasher, put all your garbage in garbage bags, secure, and place them in an outdoor can (if the cans are full, leave the secured bags in the laundry room). All recycling should be contained in the blue bin outside. Please remove all your personal food items from the cabinets and refrigerator/freezer. Q: Is The Magnolia handicap accessible? A: Technically, no. There are steps to get up to the front porch (two) but once inside, there is a bathroom on each level (two full baths) and we can arrange for sleeping on the lower level with the futons. The first floor tub is a clawfoot tub with a shower. There is a small ramp for pulling your bags up to the front porch. Q: What other types of supplies are available at the house for us to use during our stay? A: We have dishwasher tabs, dish soap, hand soap, paper towels, garbage bags, air freshener, a small first aid kit, kleenex, and toilet paper available. There is an iron available, broom, mop and vacuum (to clean small spills). There will be some personal toiletries available if you need them. Q: Are we allowed to bring alcohol on the property? A: You are welcome to have an adult beverage as long as you are of legal age. Please be respectful of the other guests and make sure your empty containers go in the recycling. There is a bottle opener and corkscrew in the kitchen. Q: Is there cable available? A: There is not cable, however there is a TV with a VCR/DVD player and Chromecast. There are several movies on-site, but feel free to bring some of your favorites with you. There is also an AM/FM/CD player and some CDs. Q: If we are coming for a family gathering, what can we do for entertainment? A: At the house, there are a number of books, games, puzzles and cards you can use. The backyard is huge for a house in town and you can enjoy the gardens. If you are looking for outdoor activities, the Ladoga Town Park is just a block away - there is a playground and ball fields. A little farther down the road, you can visit Shades or Turkey Run State Park, canoe Sugar Creek, visit Crawfordsville, zipline, attend the various festivals and events in the area. There will be information at the house as well as posted to other pages on this site.